DROPS rett på 1911 Auto rammer uten Børsemakerutstyr og separat magasinet godt kan fjernes uten å demontere pistolen. Forstørret magwell øker sterkt ramme åpning for raskere og enklere magasinet endringer. Flat boliger øker grep areal for å holde pistolen fra å ri under raske brann. Tilgjengelig i blå eller rustfritt stål med 25 lpi maskinert checkering at holder pistolen sentrert i din grep. Også tilgjengelig med eksklusive slangeskinn, Chainlink, Chainlink II og Chainlink III design. Begge maskinert i mønstre gir en svært sikker, sklisikre gripende overflate, uten "skarpheten" av konvensjonelle checkering som kan noen ganger slipes hånden eller grip din klær under en skjult bære tegn. Også tilgjengelig for offiser modell i blånert eller rustfritt stål med 25lpi checkering. Spesifikasjoner: stål, blånert (BL) eller rustfritt stål (SS). Tilgjengelig med 20, 25 eller 30 lpi checkering eller slangeskinn, chainlink, chainlink II eller chainlink III mønstre. Passer regjeringen eller Commander lengde rammer. The product itself is nicely machined and of high quality. I purchased this SPECIFICALLY because in the Q&A section the Brownell's technician stated it would fit the Sig Sauer C3 1911. Well, it does, after 3 hours of VERY CAREFUL grinding, Dremeling, and refinishing. Doesn't even come close out of the packaging. 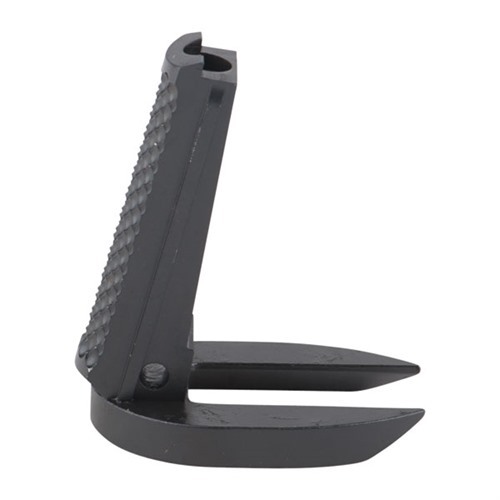 If you are not very comfortable with extreme metal removal and modifications and don't have the tools to do so do not purchase this for the Sig Sauer C3. After three hours I did finally take off enough metal to make it slide into position so I could put the takedown pin back through the frame. Not a job for anyone not willing to potentially ruin an $80 part. The fit and finish of this product is excellent, it installed first time with no modifications needed. The texture is great, not too aggressive and the weight makes my STI perfectly balanced. Bang for the buck this is a great buy. The fit is nice and tight, with no smithing required. My only complaint is that I would have liked to see 20 LPI checkering. recently bought one and in 30 mins it was done my pt1911 now has a mag guide and funnel but my stock mag wont fit because for the bumber pad but its ok cause this mag well is in two pieces. great product guys . Nice looking magwell, good quality. Requires little fitting, however, I would like to see an improved attachment method, as it can work loose, and/or rotate somewhat. But it is detachable, a good feature. Really good quality. Easily fits my 1911 Springfield "loaded" mc operator (PX9105MLP). Easily flushed with the frame to the mag well. Installed on a Springfield Armory Loaded Blue 1911 without any issues. Specifically, no additional work was needed to get it to install perfectly. The 25 LPI cuts on the Main Spring Housing (MSH) was just perfect in terms of appearance and function. The mag well opening size was just right. I was not looking for something outrageous as commonly seen on "open" race guns, but wanted something that gave me an edge at local gun range shoots. One suggestion: Use Blue (Removable) LocTite on the hex screw attaching the mag well to the MSH. If you don't the mag well will loosen after running about 30 rounds of 45 ACP through the firearm. Fit my Kimber TLEII like a glove. Finish matched my gun perfectly and required NO gunsmithing. Installed in just a few minuted. Another great product by Ed Brown!! Very few parts in the 1911 world can truly be considered "drop in". This is truly one of them and I kid you not. I received this part along with new mainsprings in the mail today so that I could replace the ILS MSH in my Springfield Armory target model. It took me about five minutes from start to finish and that included applying Loctite on the screw that attaches the Maxi-well to the MSH. Order with confidence! Perfect fit and finish. A very nice looking add-on for my 1911. No fitting required. Makes reloading much more smooth and fast, plus it looks great. Fit perfectly on my kimber eclipse custom 2. (factory mainspring houseing was plastic!) Just for information may not fit as nice in all 1911s. My dad used this same part on a les bear and had to do some fileing. Compared to other extended mag wells out there, this one fit like a glove right out of the packaging. You still have to blend the magwell itself to your existing magwell so the lines match up, but it is very easy and a great custom job to perform on your own gun. Other than blending the magwell, the lines on this matched right up to the bottom of my Kimber TLE RL2 like it was cut for it. Very good! The magwell/housing dropped right in. It is a good tight fit. The beavertail safety no longer blocked the trigger bow and required filing the two stop tangs to properly block the trigger. Very easy to fit. Overall high quality and great fit in the para gi. Just added this to my new Springfield Loaded 1911 45 and can't say enough how easy it was to install and how perfectly machined the part is. Make sure to use lock tight (blue) on the allen screw that connects the magwell to the mainspring housing. You can find these cheaper in other decent brands, but when it comes right down to it, this is your best buy. Use them exclusively and they have never required fitting, flush fit on all my guns so equipped, and mainspring housing pin dimension is spot on. Can't say that for all such products. 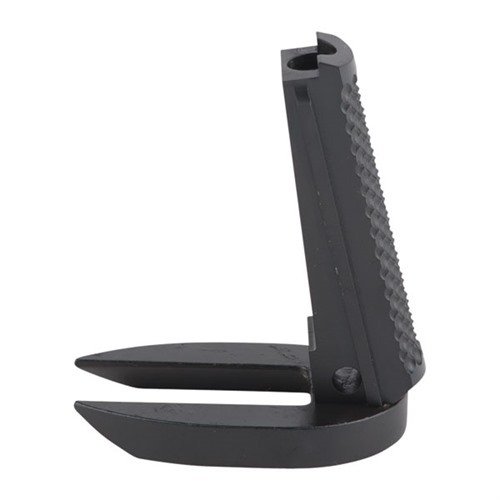 WORKS EXACTLY THE WAY IT IS SUPPOSE TO, UNFORTUNATELY THE ONLY ISSUE IS YOU WILL NEED TO ENSURE YOU EITHER HAVE OR GET CLIPS THAT FIT WITH THE MAGAZINE WELL. MY PROMAG 8 RND CLIPS DO NOT WORK. Replaced mainspring housing off a Springfield Armory Range Officer. The finish matches up nicely with the frame and the quality is excellent, as all Ed Brown products are. Truely drop in, no work needed to fit. I matched these up with a set of VZ Grips and the final product looks so good, I am very happy with this setup! I installed this magwell on my Ruger SR1911 CMD. The installation was very simple and straightforward, especially after watching some very helpful videos on YouTube. The build quality is excellent and the price is very reasonable. The fit was perfect right out of the box. I recommend this highly to anyone who wants an excellent upgrade for their 1911 from a premium builder of custom 1911s. Used this on kimber custom tle/rl II. Worried this would not match fit or finish. It dropped in like a dream and matched the finished perfectly. Main spring housing fits tighter than original, need an extra hand or one of those padded clamps like at Home Depot. The original main spring housing was polymer, this one is all steel. Adds weight to the fire arm, helps out with recoil. 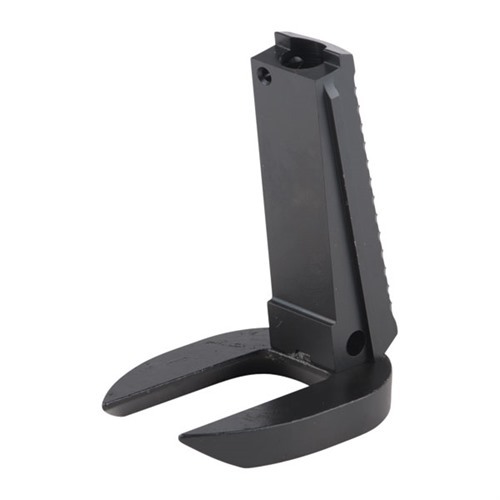 The mag well is removable with the included Allen wrench if you want to take it off for concealed carry. The mag well does not print any more than a govt model. Great product. Use this on a duty weapon as well as my smaller 1911's for CC. Reloads are seamless, there are no hangups caused by this product. Looks great too. Perfect drop-in fit in my Springfield Loaded Operator. MSH fit was snug but slid into place easily. Mag well fit flush with bottom of frame with no gap. 25 LPI checkering is grippy but not harsh. Attractive finish and great workmanship at a very reasonable price. allen head stays tight. performs as stated. Good quality. Excellent addition to weapon. Form & function! Compliments my stippled 1911 frame. Outstanding workmanship! Little tight on my gun that required minor fitting that I was able to do myself. It's the gun not and not this product. Other than that no other issues. Ten minutes top! Installed on my Pro CDP and looks great. Solid material and of course very functional, who would expect anything else from Ed Brown. Perfect fit. Just rememeber you will want new grips to accomadate the maxi-well. Installed one of these and did alot of work to a PT1911. Tho it was a taurus the pistol turned out exelant after alot of work. This mainspring housing and magwell made it really pop out. Getting ready to fit and blend a Ed Brown grip safety as well. It may be a Taurus but it shoots and looks like a much higher quality pistold now thanks to Ed Brown parts. You wont be dissapointed. This fit my Kimber Stainless Target II 9mm perfectly with zero fitting required. Looks great and feels good in my hand. The magwell fits tight without a gap. I previously reviewed one of these that I installed on my Les Baer Premiere II. That one required a lot of fitting, and I was disappointed in that, although it looked and functioned great after I got it to fit. Installed on my colt delta elite, fit great, feels better. Mag well is a little wobbly unless you crank down the tighting screw. But works as advertised. Dropped right in and fit was good, mag well is solid with no play. The down was the magwell needed to be blended for the 8 rd mec gar and 10 rd cmc mags to seat fully. The plastic bump pads would hit the well before it would lock in, after a little file work and some cold blueing in works fine. Only complaint is for the price wish it would except all mags with ease. The Ed Brown mainspring housing with maxi-well is fantastic. Yes a little pricey, but well worth the investment. Great addition to my Springfield 1911-A1 GI Model. This was a perfect drop in product. I installed this on my STI 9mm Trojan. I would have given this 5 stars, but I had to take the dremel to it to make it fit----> There is a small protrusion on the magwell that fits into the MSH (this is a 2-piece mag well). The protrusion was too big and did not fit properly into the MSH. I had to dremel a small portion of the protrusion to make it fit properly. Now that I fixed it, it looks good. I purchased this product for one of my STI's. When I installed it on the gun, I found that there was an unacceptable gap at the front of the mag well. After trying the part a few of my other 1911's (other brand guns) I found that there was a problem with the part. After a bit (a lot) of filing I finally got the thing to fit. I don't think that this is acceptable for what's supposed to be a quality part. I have other Ed Brown mag wells which with no problem. From what I've heard this isn't an unusual situation with mag wells with the chain link pattern. I put this on my STI Spartan. It was not a drop in fit by any means. The pin for the mainspring housing was drilled on an angle and required a lot of filing to fit. Once installed, more filing was required on the frame of the gun because the magwell created a "lip" where it meets the frame. After the smithing was finished it runs smooth and well. The backstrap feels like it has a great grip surface and adds to the feel of the 1911. The finish on the magwell is nice and I am ultimately pleased with the final product. I use as my carry gun and I also you it Tactical training. Works great. And easy to install. Just installed on my 1911 did just what they said droped right in.Does not interfer with grips or add to much bulk to gun can still use as ccw and i gained 2sec on my steel race time with quick reloads and in other events where not allowed dont have to take gun appart to remove just take the lower screw out and your done(just rember to put a dab of lock-tight on screw when putting back on or could be supprized when it falls of)my falt great product. I watched a couple of videos on youtube on how to install and looked at a couple of different models and this magwell was just as advertised. I selected the snakeskin finish to add a little flair to my Kimber Target Stainless and replace the cheap plastic mainspring housing. The install was super easy and it truly was drop-in for me. 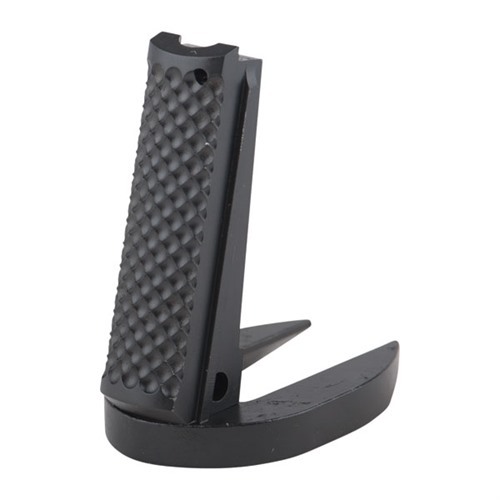 All 5 of my Wilson Combat 8 round magazines drop free, just be prepared to have difficulty with 7 round factory magazines because of the extra length added to the magwell. Have a Chip McCormick 10 round mag on the way to test. Getting ready for limited-10 competition in IPSC/USPSA. If the Chip McCormick drops free...look out. Gave it 5 stars because I can't imagine it being any better...but what do I know? Looks even better in real life. fit very well to my colt gold cup with only minor adjustments. I have a S&W 1911 E-series. I wanted a back strap maxiwell that complimented the fish scale on the slide as well as fit the magazine well. This one does both perfectly. The well lines up exactly with the mag opening and the snakeskin sorta looks like the fish scale. It dropped right in and seemed to fit better than the stock one. None of these are cheap but based on what I have seen, they're top of the line. So if you are going to buy one,you can't go wrong with this one. Installed this on a Springfield NM and couldn't be happier. The fit is perfect. I use an assortment of mags in this pistol and all work flawlessly. Improved the appearance to the point I get many compliments on the pistol. Using Composite grips is no problem either. I am buying another in Blk for my other Springfield NM. Improves grip positioning also. big help if you have very large hands. Not having to remove the housing to remove the well is a great advantage. What you would expect from Ed Brown products. I've used Ed Brown MSH/MaxiMagwell's on three of my other 1911's. All were of good quality, and all required minor fitting in order for the grip safety to properly engage and for the magwell extension to sit flush against the base of the frame. This product amazingly required no fitting what-so-ever; fit and functioned perfectly on my Springfield 1911-A1 Loaded Target. The snakeskin pattern is by far the most aggressive that I've used (25LPI and Chainlink being the others I have). Even a sweat soaked hand will stay put on this. This is the second Ed Brown Drop In Maxi-Well that I have purchased. The first, a 25 lpi checkered model, installed so easily on a Ruger SR. 1911 that I have that I decided to get a second one for my new Kimber Stainless Target II in 9mm. This time I bought the Snakeskin version because I liked the pattern on my Ed Brown Kobra Carry. Once again, it fit perfectly. True drop in, absolutely no fitting required, and the quality is just what you expect from Ed Brown. Factor in the attractive price and it's hard to lose. Hint: when you install put a drop of blue Loctite on the small screw that holds the mag well in place. If you don't you will find yourself tightening it frequently at the range. I installed this in about 5 min. Works well. Looks great. The snakeskin scale pattern is very tactile and matches the S&W E-Series 1911 very well. I purchased this in stainless for one of Springfield 1911's and the fit was perfect in every way. Absolutely drop in right out of the package. The appearance change to the pistol drew a lot of attention. It gave my hand (rather large) a perfect platform for that "perfect" grip. Mag changes are faster with no "fumbling". Ultimately, I just purchased another one for my newest Springi. Not only looks good but is very functional as well. I love the idea that I don't have to remove the entire housing just to remove the mag well. Simply take out the bottom screw and the well is gone. I have thousands of rounds through this gun and the bottom screw has NEVER loosened as some people fear. I have been buying Ed Brown products for years and they make some of the best so don't worry about it not fitting or screws falling out If your that scared and feel you must, add a SMALL dot of blue lock tight to the screw threads. True drop in. Purchased the replacement kit with the magwell for convenience. Excellent fit on my 1911 with nice finish all around. Snakeskin pattern is very functional and looks great. Easy install but pick up the kit if you own this 1911. You need the parts due to the ils. This is a very well built magwell that makes quick mag changes easier. I had to gently touch the edges of my vz grips the very edge of the rear grip stuck out just enough to be a nuisance. Not magwell issue it was the grips. This mainspring housing was very easy to install, no filing required on my SA Range Officer. Snakeskin checkering is FANTASTIC. Excellent traction without being painful. I immediately saw/felt improvement in reload ease and speed. It is noticeably heavier than the stock mainspring housing, but that was expected. Drop in fit in 2 Sig 1911s, I like the extra length it fits my hand better. I have this Ed Brown Maxi Well on my custom Remsport SS 45 government model and I would recomend it to anyone looking to speed load follow up mags smoothly. It also looks great and doesn't snag. I've used several of these in different surface types, probably 6 or 7 in the last 5 years. Never had to fit one. You can get similar surfaces from other sources, and they are generally fine except for one thing, typically--if you're using full size grip panels with flat bottoms, the panels will hang over the contours of the actual mag well and look, well, pretty stupid. Never does this happen on an Ed Brown Maxi-Well, not in my experience, anyway. It is the most seamless of all, hands down. Great product, not a bad price at all for so much quality and thought put into the product. I bought both the Smith and Alexander and the Ed Brown Maxi-Well. The Ed Brown is head and shoulders better in the finish and machine work. The S&A does extend the checkering onto the mag well itself, but I don't see my grip being down that low. Another concern of the Ed Brown was the 2 piece design. It is keyed so I don't see it wobbling around and a little blue or maybe red loctite on the bolt should keep it in place as long as I want it there. Installed two of these, one on each of my Kimbers. The stock spring housing is plastic, and this product is well machined SS. The fit and finish are great, and I really don't have anything negative to say. Oh, and with no real specialty tools it's only about a 15 minute job. Just received it yesterday (two days early, I may add) and switched it out for the stock main spring housing on my Taurus PT1911SS. It slipped right in, no fitting required. My only issue is that it doesn't work with the stock Taurus magazines. The base plate is too thick so it his the sides of the well. I just filed down the top of the base plates a little bit and they fit fine. I can't wait to take it to the range and try it out. This was my first buy from Brownells and it definitely won't be my last. I installed this magwell along with the G10 grips to round out my DW Pointman. No smithing required, fit is good but not custom as there is a small gap between the magwell shoe and the base of the frame. This does not affect function and isn't noticable without close scrutiny. Finish on the shoe is fair, sort of a matte sandblasted look, it really doesn't look like SS but goes ok with the composit grip plates. The shoe is seperate from the backstrap and is secured with one countersunk hex head screw which does allow the shoe to be removed while installing the backstrap (handy). The magwell does improve reloads since the steel mag will slide over the steel opening easily, more readily than the composite magwell/grip combo I had installed before. Worth doing, a good magwell without extra smithing at a reasonable price. I received the Maxi Well in only three days after ordering. It took me only 5 minutes to install in my Colt 1991A1. everything fit perfectly. it helped me cut my reloading time in half for IDPA competition. I can still use this pistol for concealed carry because the Maxi Well doesn't add that much extra size to the grip. A great product. I lightly cleaned/deburred the edges with a fine stone for smoother fit. Without question the Maxi Well couldn't work or look any better. Installed in 5 minutes on my Sig Sauer Traditional Match Elite, that's how easy it was, did not even have to remove the grips. I installed this Ed Brown Drop-in Magwell in 5 mins, in my 25 yr old Springfield Armory 1911 A-1. The install time included removal of the old mainspring housing, removing the spring and plunger from it, and installing those parts in the new Ed Brown housing. The Ed Brown Drop-In Magwell really was a drop-in part in my gun. The fit was perfect and didn't require any fitting whatsoever. I've never had an issue with any Ed Brown products. The items I've purchased have always been of top quality and have been well worth the cost. Produsentnr. : 818C2 800732818184 DROPS rett på 1911 Auto rammer uten Børsemakerutstyr og separat magasinet godt kan fjernes uten å demontere pistolen. Forstørret magwell øker sterkt ramme åpning for raskere og enklere magasinet endringer. Flat boliger øker grep areal for å holde pistolen fra å ri under raske brann. Tilgjengelig i blå eller rustfritt stål med 25 lpi maskinert checkering at holder pistolen sentrert i din grep. Også tilgjengelig med eksklusive slangeskinn, Chainlink, Chainlink II og Chainlink III design. Begge maskinert i mønstre gir en svært sikker, sklisikre gripende overflate, uten "skarpheten" av konvensjonelle checkering som kan noen ganger slipes hånden eller grip din klær under en skjult bære tegn. Også tilgjengelig for offiser modell i blånert eller rustfritt stål med 25lpi checkering. Produsentnr. : 819F25 800732819013 DROPS rett på 1911 Auto rammer uten Børsemakerutstyr og separat magasinet godt kan fjernes uten å demontere pistolen. Forstørret magwell øker sterkt ramme åpning for raskere og enklere magasinet endringer. Flat boliger øker grep areal for å holde pistolen fra å ri under raske brann. Tilgjengelig i blå eller rustfritt stål med 25 lpi maskinert checkering at holder pistolen sentrert i din grep. Også tilgjengelig med eksklusive slangeskinn, Chainlink, Chainlink II og Chainlink III design. Begge maskinert i mønstre gir en svært sikker, sklisikre gripende overflate, uten "skarpheten" av konvensjonelle checkering som kan noen ganger slipes hånden eller grip din klær under en skjult bære tegn. Også tilgjengelig for offiser modell i blånert eller rustfritt stål med 25lpi checkering. Produsentnr. : 818S 800732819020 DROPS rett på 1911 Auto rammer uten Børsemakerutstyr og separat magasinet godt kan fjernes uten å demontere pistolen. Forstørret magwell øker sterkt ramme åpning for raskere og enklere magasinet endringer. Flat boliger øker grep areal for å holde pistolen fra å ri under raske brann. Tilgjengelig i blå eller rustfritt stål med 25 lpi maskinert checkering at holder pistolen sentrert i din grep. Også tilgjengelig med eksklusive slangeskinn, Chainlink, Chainlink II og Chainlink III design. Begge maskinert i mønstre gir en svært sikker, sklisikre gripende overflate, uten "skarpheten" av konvensjonelle checkering som kan noen ganger slipes hånden eller grip din klær under en skjult bære tegn. Også tilgjengelig for offiser modell i blånert eller rustfritt stål med 25lpi checkering. Produsentnr. : 819S 800732819037 DROPS rett på 1911 Auto rammer uten Børsemakerutstyr og separat magasinet godt kan fjernes uten å demontere pistolen. Forstørret magwell øker sterkt ramme åpning for raskere og enklere magasinet endringer. Flat boliger øker grep areal for å holde pistolen fra å ri under raske brann. Tilgjengelig i blå eller rustfritt stål med 25 lpi maskinert checkering at holder pistolen sentrert i din grep. Også tilgjengelig med eksklusive slangeskinn, Chainlink, Chainlink II og Chainlink III design. Begge maskinert i mønstre gir en svært sikker, sklisikre gripende overflate, uten "skarpheten" av konvensjonelle checkering som kan noen ganger slipes hånden eller grip din klær under en skjult bære tegn. Også tilgjengelig for offiser modell i blånert eller rustfritt stål med 25lpi checkering. Produsentnr. : 818C 800732819044 DROPS rett på 1911 Auto rammer uten Børsemakerutstyr og separat magasinet godt kan fjernes uten å demontere pistolen. Forstørret magwell øker sterkt ramme åpning for raskere og enklere magasinet endringer. Flat boliger øker grep areal for å holde pistolen fra å ri under raske brann. Tilgjengelig i blå eller rustfritt stål med 25 lpi maskinert checkering at holder pistolen sentrert i din grep. Også tilgjengelig med eksklusive slangeskinn, Chainlink, Chainlink II og Chainlink III design. Begge maskinert i mønstre gir en svært sikker, sklisikre gripende overflate, uten "skarpheten" av konvensjonelle checkering som kan noen ganger slipes hånden eller grip din klær under en skjult bære tegn. Også tilgjengelig for offiser modell i blånert eller rustfritt stål med 25lpi checkering. Produsentnr. : 819C 800732819051 DROPS rett på 1911 Auto rammer uten Børsemakerutstyr og separat magasinet godt kan fjernes uten å demontere pistolen. Forstørret magwell øker sterkt ramme åpning for raskere og enklere magasinet endringer. Flat boliger øker grep areal for å holde pistolen fra å ri under raske brann. Tilgjengelig i blå eller rustfritt stål med 25 lpi maskinert checkering at holder pistolen sentrert i din grep. Også tilgjengelig med eksklusive slangeskinn, Chainlink, Chainlink II og Chainlink III design. Begge maskinert i mønstre gir en svært sikker, sklisikre gripende overflate, uten "skarpheten" av konvensjonelle checkering som kan noen ganger slipes hånden eller grip din klær under en skjult bære tegn. Også tilgjengelig for offiser modell i blånert eller rustfritt stål med 25lpi checkering. Produsentnr. : 818F25 800732818023 DROPS rett på 1911 Auto rammer uten Børsemakerutstyr og separat magasinet godt kan fjernes uten å demontere pistolen. Forstørret magwell øker sterkt ramme åpning for raskere og enklere magasinet endringer. Flat boliger øker grep areal for å holde pistolen fra å ri under raske brann. Tilgjengelig i blå eller rustfritt stål med 25 lpi maskinert checkering at holder pistolen sentrert i din grep. Også tilgjengelig med eksklusive slangeskinn, Chainlink, Chainlink II og Chainlink III design. Begge maskinert i mønstre gir en svært sikker, sklisikre gripende overflate, uten "skarpheten" av konvensjonelle checkering som kan noen ganger slipes hånden eller grip din klær under en skjult bære tegn. Også tilgjengelig for offiser modell i blånert eller rustfritt stål med 25lpi checkering. Produsentnr. : 819C2 800732818214 DROPS rett på 1911 Auto rammer uten Børsemakerutstyr og separat magasinet godt kan fjernes uten å demontere pistolen. Forstørret magwell øker sterkt ramme åpning for raskere og enklere magasinet endringer. Flat boliger øker grep areal for å holde pistolen fra å ri under raske brann. Tilgjengelig i blå eller rustfritt stål med 25 lpi maskinert checkering at holder pistolen sentrert i din grep. Også tilgjengelig med eksklusive slangeskinn, Chainlink, Chainlink II og Chainlink III design. Begge maskinert i mønstre gir en svært sikker, sklisikre gripende overflate, uten "skarpheten" av konvensjonelle checkering som kan noen ganger slipes hånden eller grip din klær under en skjult bære tegn. Også tilgjengelig for offiser modell i blånert eller rustfritt stål med 25lpi checkering. Produsentnr. : 81825OF 800732819150 DROPS rett på 1911 Auto rammer uten Børsemakerutstyr og separat magasinet godt kan fjernes uten å demontere pistolen. Forstørret magwell øker sterkt ramme åpning for raskere og enklere magasinet endringer. Flat boliger øker grep areal for å holde pistolen fra å ri under raske brann. Tilgjengelig i blå eller rustfritt stål med 25 lpi maskinert checkering at holder pistolen sentrert i din grep. Også tilgjengelig med eksklusive slangeskinn, Chainlink, Chainlink II og Chainlink III design. Begge maskinert i mønstre gir en svært sikker, sklisikre gripende overflate, uten "skarpheten" av konvensjonelle checkering som kan noen ganger slipes hånden eller grip din klær under en skjult bære tegn. Også tilgjengelig for offiser modell i blånert eller rustfritt stål med 25lpi checkering. Produsentnr. : 81925OF 800732819198 DROPS rett på 1911 Auto rammer uten Børsemakerutstyr og separat magasinet godt kan fjernes uten å demontere pistolen. Forstørret magwell øker sterkt ramme åpning for raskere og enklere magasinet endringer. Flat boliger øker grep areal for å holde pistolen fra å ri under raske brann. Tilgjengelig i blå eller rustfritt stål med 25 lpi maskinert checkering at holder pistolen sentrert i din grep. Også tilgjengelig med eksklusive slangeskinn, Chainlink, Chainlink II og Chainlink III design. Begge maskinert i mønstre gir en svært sikker, sklisikre gripende overflate, uten "skarpheten" av konvensjonelle checkering som kan noen ganger slipes hånden eller grip din klær under en skjult bære tegn. Også tilgjengelig for offiser modell i blånert eller rustfritt stål med 25lpi checkering. Produsentnr. : 818C3 800732818313 DROPS rett på 1911 Auto rammer uten Børsemakerutstyr og separat magasinet godt kan fjernes uten å demontere pistolen. Forstørret magwell øker sterkt ramme åpning for raskere og enklere magasinet endringer. Flat boliger øker grep areal for å holde pistolen fra å ri under raske brann. Tilgjengelig i blå eller rustfritt stål med 25 lpi maskinert checkering at holder pistolen sentrert i din grep. Også tilgjengelig med eksklusive slangeskinn, Chainlink, Chainlink II og Chainlink III design. Begge maskinert i mønstre gir en svært sikker, sklisikre gripende overflate, uten "skarpheten" av konvensjonelle checkering som kan noen ganger slipes hånden eller grip din klær under en skjult bære tegn. Også tilgjengelig for offiser modell i blånert eller rustfritt stål med 25lpi checkering. Produsentnr. : 819C3 800732819310 DROPS rett på 1911 Auto rammer uten Børsemakerutstyr og separat magasinet godt kan fjernes uten å demontere pistolen. Forstørret magwell øker sterkt ramme åpning for raskere og enklere magasinet endringer. Flat boliger øker grep areal for å holde pistolen fra å ri under raske brann. Tilgjengelig i blå eller rustfritt stål med 25 lpi maskinert checkering at holder pistolen sentrert i din grep. Også tilgjengelig med eksklusive slangeskinn, Chainlink, Chainlink II og Chainlink III design. Begge maskinert i mønstre gir en svært sikker, sklisikre gripende overflate, uten "skarpheten" av konvensjonelle checkering som kan noen ganger slipes hånden eller grip din klær under en skjult bære tegn. Også tilgjengelig for offiser modell i blånert eller rustfritt stål med 25lpi checkering.